The condition of night sweat is marked by uncomfortable perspiration at night while asleep. Although the condition is most often linked to menopause in women, it can also be a symptom of illness or a side effect of medicines you are taking. Such sweats can be very debilitating for patents, as they affect the quality of sleep as well as of life in many unpleasant ways. Luckily, there are many non-prescription remedies including herbal ones, which help reduce the intensity of sweats or prevent them. Many people have claimed that they have experienced alleviation or elimination of sweat episodes at night when they consume a few herbal supplements in proper dosages. Experts say that these herbs may be effective in healing the condition by stabilizing the hormone levels that are responsible for increasing the body’s temperature. 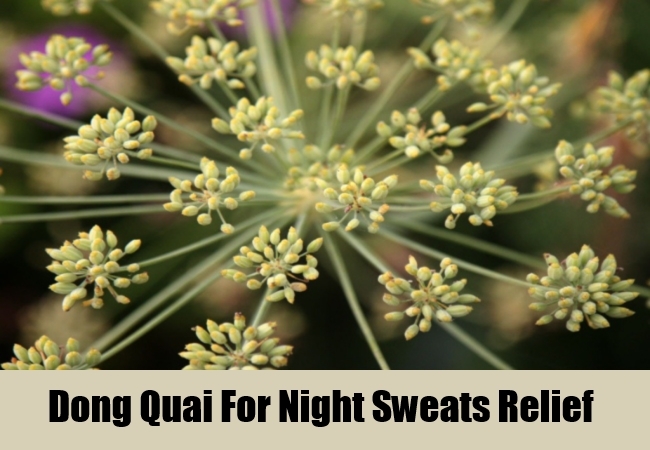 Here are a few herbal remedies for night sweats to try! According to the University of Maryland Medical Center (UMMC), black cohosh is one of the ancient herbs, which is admired for its ability to treat menstrual problems. This herb contains active compounds called phytosterols that play the role of estrogen in the body.Estrogen is a hormone whose level gets reduced during menopause due to which hot flashes and night sweats are triggered. UMMC recommends a dose of 40 to 80mg daily for experiencing relief. Warning: Women who have experienced breast cancer should never take this herb without consulting their doctor. Black cohosh is phytoestrogenic herb that may badly influence the development of hormone-sensitive cells of cancer. According to the Association of Women for the Advancement of Research and Education’s Project (AWARE), chasteberry can be an effective herbal remedy for night sweats because it can control the production of hormones. Night sweats that occur due to any reason are often the outcome of a malfunction of the internal thermostat, says Mayo Clinic. One of the vital roles of the hormones is to inform the brain to cool off the body. This is exactly what chasteberry does to minimize sweating. The herb also works by boosting the production of progesterone in the body. This is one of the widely used Chinese herbs since centuries for treating a variety of menopausal symptoms such as night sweats and hot flashes. This has been acknowledged by ‘The Pacific College of Oriental Medicine’. In most cases, wild mountain yam is utilized along with other Chinese herbs in supplements to reduce the menopausal symptoms and other triggers producing much heat. The herb is available as a tonic at any health food store.As a tip, do discuss with your herbalist about how to consume this tonic because the methodology may differ from one patient to another. UMMC has recognized this herb as a natural circulation booster. This is because red clover has been in use since centuries for improving the circulation and eliminating surplus fluids from the body. Further, the herb is rich in isoflavones that tend to play the role of estrogen in the body. This blend of hormonal mimicking and circulation control help people to obtain relief from night sweats. Mayo Clinic says that this herb is effective, especially when sweats are due to hot flashes. Warning: Patients who have the history of uterine, ovarian, or breast cancers must avoid using this herb. This is because it can possibly create a few complications. This is a Chinese herb that may be useful in experiencing relief from night sweats. According to Breastcancer.org, the blood vessels tend to dilate for dispersing excess heat that is put off by the body when the temperature rises during an episode of sweat. The herb has the ability to stabilize the blood vessels, which is why dong quai can help experience relief from the condition.One of the clinical trials as recorded in the 2007 issue of ‘Gynaecological Endocrinology’ had concluded that dong quai can reduce hot flashes and night sweats. You can choose to consume dong quai either in the form of liquid extract or powdered capsules. Sage is a famous herb that is used in cooking. However, Ageless who is a South African herbal supplement manufacturer says that this herb can also be consumed orally to keep night sweats at bay. This is because it has been found that one of the several medicinal qualities that this perennial shrub possesses is estrogenic. Just like red clover and black cohosh, sage may also be effective in stabilizing the hormonal levels for signaling the body to manage the temperature. There are times when night sweats are not due to menopause or changing hormone levels. Chronic ailments such as tuberculosis and bronchitis can often trigger night sweats as well as hot flashes. 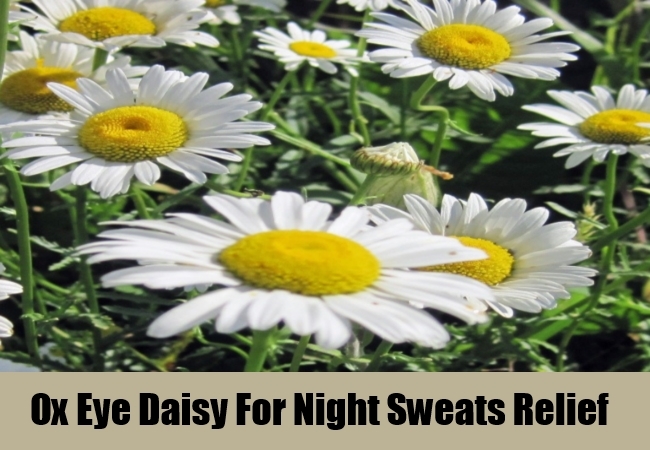 People suffering from these symptoms can try Ox Eye Daisy for experiencing relief. According to the Mississippi Valley Archaeology Center in La Crosse, the Menominee Indians were quite fond of this herb for treating inflammation and other symptoms. They used to have this herb as an infusion or as a tonic. Today, the herb’s balsamic flavored flowers are brewed to take advantage of their therapeutic properties. Honey is added to the mix after straining the flowers for obtaining a sweet syrup to relieve night sweats. This herb is among those remedies that help decrease the intensity as well as frequency of night sweats and boost sleep quality. According to Ed Smith who is a medicinal expert, schisandra has the potential to reduce night sweats apart from impulsive perspiration. The University of Michigan Health System (UMHS) explains that Schisandra, a woody vine, has red berries that are rich in lignans. They are the active constituents that make berries therapeutically powerful due to their rich antioxidant, astringent, and sedative properties. Therefore, you can try this herb as a supplement after consulting with your doctor about the dosage, as that is not standard for all patients. Note: Some of these herbs can trigger mild to medium side effects. Therefore, it is advisable not to try any of the aforementioned remedies without taking the guidance of your doctor. This will ensure that you will choose the most suitable herbal remedies along with their right dosage.